I believe I first heard about Magic Lost, Trouble Found throughTia's review over at Fantasy Debut. In it Tia referred to Lisa Shearin as "the Janet Evanovich of fantasy," and, well, who doesn't want to get a piece of that action? Seriously, I can't believe it's taken me this long to get around to doing just that. 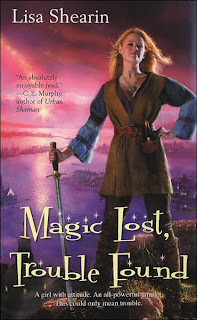 This series seems to be most often described as regular fantasy with a decidedly urban fantasy heroine, complete with charming (at times self deprecating) sense of humor. I would agree with this assessment. Raine's internal dialogue is very much in keeping with urban fantasy trends. She'll be the first one to tell you, she's one part disreputable imp, two parts defender of all that is good. And she can handle anything that comes her way. And the excellent part is--all kinds of heinousness comes her way and she handles it with aplomb (and the aforementioned sense of humor). Raine Benares is a seeker, finder of lost things and/or people. Raine's family name is a bit on the infamous side and, for the most part, Raine is just fine with that. In the opening scene of the book, she and her rake of a cousin Phaelan find themselves fighting off goblin shamans in an attempt to protect Raine's sometime partner and thief extraordinaire Quentin. Just what Quentin has stolen remains a mystery, but it soon becomes crystal clear every agent of evil in the vicinity would like to get their paws on it. Turns out the object is an ancient amulet which finds its way around Raine's neck and refuses (rather gruesomely) to be removed. Enter the Conclave Guardians, an elite force of healer-magicians whose job it is to retrieve the amulet and stash it back under lock and key. Stat. Dangerous and colorful characters abound, including the powerful Mychael Eilieson--Paladin of the Guardians--and Raine's friend Tamnais Nathrach--shady nightclub proprietor and former member of the goblin royal family. Oh and, by the way, these aren't your run-of-the-mill goblins. You want these goblins to sit down and stay awhile. What a pleasant surprise this book was and how well-timed a read. A funny, delectable treat smack dab in the middle of winter. Raine is extremely likeable and I appreciated that she always seemed fully cognizant of her own motivations and never persisted in sugar-coating them or in being stubborn beyond all reason. In that way she reminded me of Kate Daniels from Ilona Andrews' Magic Bites. Like Kate, Raine appears to have a few secrets she's not interested in revealing, even to her closest confidantes. I have a few suspicions and look forward to finding out more as the series progresses. All of the side characters felt fully formed and like people/elves/goblins/what have you that I'd like to have around, and certainly want to read more about. And, while I would really rather the love triangle not drag out anywhere near as long as the whole Morelli-Stephanie-Ranger fiasco has, I have to say I am a hopeless Babe and am therefore (unsurprisingly) firmly in the Team Tam camp. Mychael is nice. Of this there is no doubt. But, aqua eyes aside, there's just no contest. This really is a delightful, addictive debut novel and I am very happy to have the sequel sitting on my nightstand. LOL. I am so firmly in the Morelli and Mychael camp! I have to say I liked the second book better than this one. Am looking forward to the third book next year! Wow; this was my first review, ever. Thank you for linking it! Tia, you are most welcome. Thank you for leading me to these awesome books! Yay Team Tam! I'm always a sucker for the bad boys too. So glad you liked this one, Angie. I agree with Li, book 2 is a wonderful read and you will not be disappointed. Now, just (im)patiently waiting for The Trouble With Demons! Another one for the library request list! Thanks for all of your wonderful, tempting reviews! (The Hollow Kingdom just came in for me - finally - and I can't wait to dig in.) Hope you have a wonderful holiday season!! Oh, I am SO Team Tam. So let it be done. Can't wait for more Tam/Raine sizzle in The Trouble With Demons. Chelle, you are more than welcome. I hope you enjoy The Hollow Kingdom and the holiday season as well! As soon as I finished Armed & Magical, I immediately went and read the first 3 chapters of TTwD on your site. Thanks for the present. It was a treat!